New version Tytera TYT TH-9800 Plus - Quad band with 2 separate VFO for 10, 6, 2 meters and 70cm. - Connectors Antenna: SO-239 (UHF female). Comes complete with: 1 TYT TH-9800 Plus mobile radio, 1 remote support for the panel front, 1 extension cable for the front, 1 microphone clip fastening, 1 mount bracket, 1 DC power cable, screws and fuse, English manual + USB programming cable Tytera included. 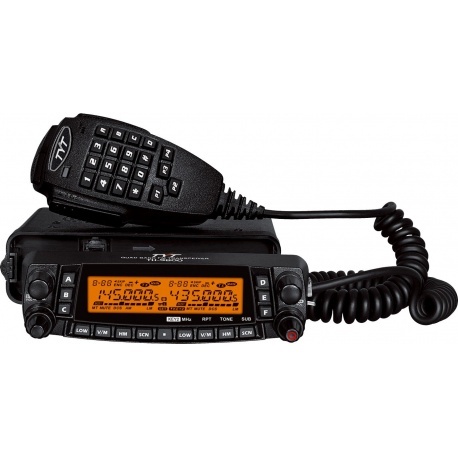 Description: New version Tytera TYT TH-9800 Plus - Quad band with 2 separate VFO for 10, 6, 2 meters and 70cm . - Covers 4 bands in FM mode 29/50/144 MHz with 50 watts, and 430 MHz with 40 watts - 108-118Mhz AM Aircraft band (receive only) - Full duplex mode VHF UHF - Double VFO, simultaneous reception V V +, V + U, U + U - Micro Multi-function - External speaker jack - 1750Hz Tone, CTCSS, DTMF and 800 channels - Connectors Antenna: SO-239 (UHF female). Comes complete with: 1 TYT TH-9800 Plus mobile radio, 1 remote support for the panel front, 1 extension cable for the front, 1 microphone clip fastening, 1 mount bracket, 1 DC power cable, screws and fuse, English manual + USB programming cable Tytera included .